Posting on behalf of a good friend, please share. Any media enquiries to the deceased direct family, kindly contact through me. I am not writting this article to gain any sympathy, there is no point doing so. I would like to reveal the mishandling of the case and action taken by Grab company. My elder brother committed suicide on 19 June 2018. He was working as a Grab driver. He joined Grab as a private car driver in 2014 during Grab’s early start up days. 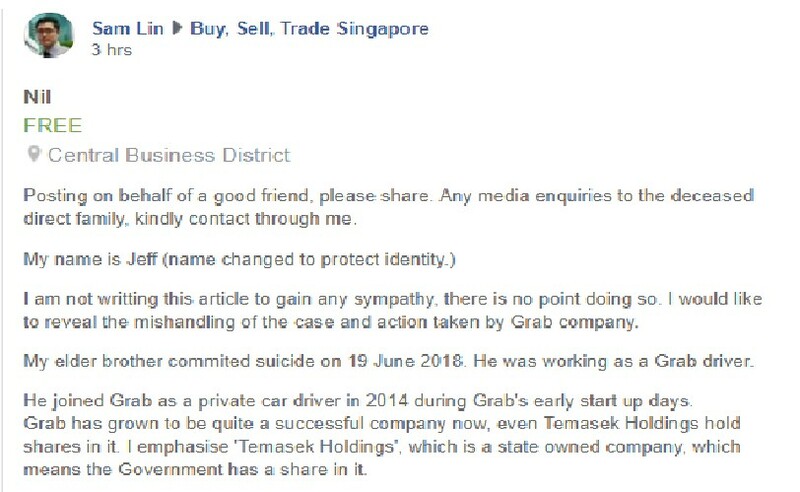 Grab has grown to be quite a successful company now, even Temasek Holdings hold shares in it. I emphasise ‘Temasek Holdings’, which is a state owned company, which means the Government has a share in it. Grab is a success in a financial sense, however in the morale sense, it is a total failure. Allow me to share the experience regarding the full incident. On 15 June 2018, a passenger had made a police report and a complain to Grab for outrage of modesty. My elder brother picked up 2 passengers, 1 alighted in Choa Chu Kang and the other alighted in Woodlands. The complain and allegation was made by the 2nd passenger. The point i am making is, the police had not interviewed him nor made any charge in the law court, so why did Grab fire him without an investigation made? Their “investigation” is just by listening to customers, as customers are always right. Many Grab drivers will agree with me on this, how many of you got suspended for a few days just because customers complained? With Grab’s incentives dropped and a 20% cut from the passengers’ fare as commission to Grab, many drivers would have faced financial difficulties. They have families to feed. My elder brother felt that being fired out of nowhere would bring more financial difficulties to himself and his family. He committed suicide so that his family could get an insurance payout. I went to Grab’s HR department and Invrstigation department thrice, but they brushed off the incident. 2 staffs who claimed to be the head of the investigation team ascertained that Grab did their investigation proper and that led to the firing off my brother. I repeat it was not a suspension, it was termination, without first clearing the case with the police. This is so much for financial gains and neglecting morale values. I urge the Grab drivers, do not waste your life away slogging for an immoral company. For such an income, there are many safer jobs out there. This ensures your family ricebowl as well as your safety.